Listed in "Suburban Family" as an up and coming young artist. My nephew, Mitchell is a sixteen year old with mild autism. His eye for color, texture and vision is something too truly see. His artwork is available for purchase and comes in many different forms. Please visit his website for details and to see more of his distinctive work. Each individual with autism is unique. Many of those on the autism spectrum have exceptional and distinctive abilities and “atypical” ways of viewing the world. Increasing acceptance, respect and support is just part of the solution. Please visit www.Autism-society.org or www.Autism-speaks.org to learn more. We have had great success with using Sherwin-Williams exterior "Duration". A product that goes on twice as thick as regular paint at 7 mills. We typically, have the technical expert from Sherwin-Williams stop by our job site prior to us starting and inspect the existing surfaces and make technical recommendations for the job. This provides our job with the best performance and longevity. We typically recommend a yearly cleaning and or power washing to keep the surfaces performing to there full potential. We typically concentrate on the entry areas as this is typically the most seen. Removed all existing wood posts, rails and decking. Installed all new AZEK posts, rails and decking. Historical Exterior Painting, repair & brick re-pointing. This historical Newtown Borough home located on Washigton Ave. was painted. All lower portion trim, eves, posts, window and porch floors cleaned, scraped and primed and painted with Duration exterior paint. Porch posts were repaired prior to painting from rotted wood areas. Along with the painting and repair we also installed a new subfloor and new finished floor in the laundry room. Additionally, we repaired the dining room ceiling from a water leak. Also, visit the Picture Gallery page II to view "The ceiling" we created. Dug post holes installed posts. Measured and setup for 11/2 pipe rail, manufactured by Hendrix Welding. Installed rail, painted. This barn/garage/2nd story living space located in the Borough of Newtown was power washed, scraped, sanded primed and painted two coats of exterior "Duration" Sherwin-Williams paint. This property located in Morrisville recieved a much needed repair to the existing dormers. The original siding installation was done incorrectly by a prior contractor. We removed all existing siding and replaced with a better quality brand, Completed pictures to come. This custom built home, located in the Solebury area, was originally painted by us inside and out in 1997 as new construction. Maintained the property yearly and re- painted interior and exterior in 2009/10. This commercial property located in Lambertville, N.J. at 55 Bridge Street was rehabbed inside and out ( 2002) The interior was completely painted with various repairs completed to the plaster and lath walls, including skim coating.The interior and exterior trim was oil primed and oil painted. 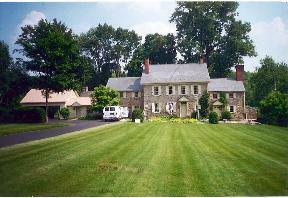 This property is maintained by us with regular exterior washing and cleaning to keep its pretigious appearence. We recently cleaned and resealed the mahogany porch deck. Exterior trim painting of residence in Morrisville. This estate located outside of New Hope was power washed. scraped, sanded and primed where needed with various windows needing to be reglazed and the metal roofs were painted in oil with a metal rust inhibitor primer. This property since our completion in 1998 has been maintained by us on a yearly basis to keep it looking great inside and out. This is a multiple application faux finish. Click a pic to see more detail. Exterior shutter, entryway and door painting. We are currently working on the interior main foyer, dining room and parlor. At the present time we removed wallpaper from the main foyer and most of the existing moldings including crown, base and entry trims and have upgraded to larger scale. Pictures before and after will soon be posted. This home was painted by us back in 1985. We have recently been back this season (2006) and have repainted various areas of the exterior along with the metal roof areas which we scraped and primed with a heavy duty rust inhibiting primer and top coated with a rustoleum oil gloss. The interior was custom painted by us in 1983 and recently freshened up and color changed some areas. This property was the builders spec home for the developement. We were asked to remove the interior partitioning and remove the front wall area to convert the area back into a garage. The concrete floor and header beam were already installed when constructed. Once cleaned out and framed a garage door was installed by a seperate company. This property was painted in 2001. This home located in Yardley was originally painted in 1983 and repainted to change the color scheme in 1996. This property in Yardley was originally painted in 1983 and repainted in 1997. This home also in Yardley was painted in 1997.